There is more to hair styling than just hair straightening. You can occasionally try adding a few curls to accentuate your beauty. You may as well add a few ringlets on the tips of the hair or even iron your tresses. However, all this can only be possible if you have a 2 in 1 hair straightener and curler. A good hair straightener and curler can protect your hair from any unnecessary damage while still delivering fantastic styling options. But what do you look out for when selecting a 2 in 1 hair straightener and curler? One, you should consider the shape of the device. Even though they may all seem to have flat surfaces, you should find one that has a slightly rounded plate and outer edge. It will help in providing smooth transitions from a straightener to a curling iron making it easy to use. The metal plate is also an important consideration before purchasing. If you have fine hair, you may consider getting a hair straightener and curler with narrow plates. Wider plates are more likely to cause damage to your hair shafts since they release more heat. Additionally, appliances with small plates are also suitable for traveling as they can easily fit in your bag. The metal plates come from a variety of metals and other substances. 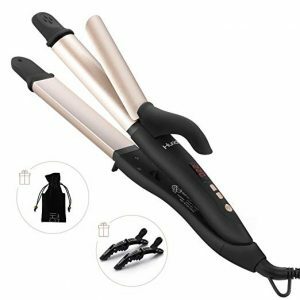 After taking into consideration all that is needed to get the best hair results, we identified the three best 2 in 1 hair straightener and curler in the market today. 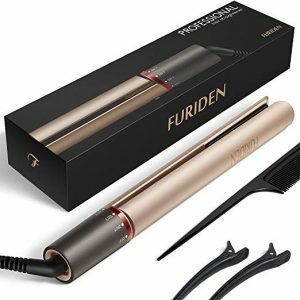 The Furiden 2 in 1 Tourmaline Ceramic Flat Iron is a professional hair straightening and curling device that can deliver an ultra-smooth and silky hair with the touch of a button. The straightener and curler can heat up within 15 seconds helping to significantly reduce the time it takes when straightening or styling the hair when you compare to other straighteners. It comes with a 97-inch long cord to help you navigate around the room with ease while using it. The wire has a 360 degrees swivel cord that allows you to style your hair from whichever angle with convenience. The Furiden 2 in 1 Tourmaline Ceramic Flat Iron makes an excellent travel companion as it has a dual voltage of (110 -24AC) allowing it to heat up from anywhere in the world without damage. It as well measures 12 inches making it good enough to fit in a handbag. The Huachi 2 In 1 Curling Iron Flat Iron is a professional salon hair straightening and curling tool. 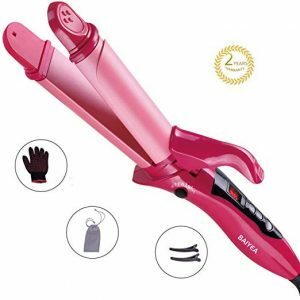 It comes with an adjustable temperature of 100 to 150 degrees for use on delicate hair, 150 to 180 degrees for healthy hair and 180-220 degrees for use on thick and wavy hair. The metal base of the device is of tourmaline technology with a coating of ceramic. The tourmaline helps the heating panels to seal the moisture in the hair and prevent frizz. The ceramic on the other hand keeps the hair from over styling. It comes with a safety anti-scalding feature to prevent burns when handling the device. You can use the tool from anywhere in the world as it features a dual voltage that automatically adjusts to the right voltage when in use. The BAIYEA Hair Straightener Professional Flat Iron Curling Wand comes with a switch button that can change from straightening to curling. The device uses ceramic metal plates that have a coating of tourmaline that helps to seal the moisture on the hair and reducing on the frizz and giving your hair shine. The straightener and curler come with four heat settings that allow it for use on all the hair types. It has a round barrel with a large surface area that allows for maximum results by maintaining a consistent heat for the maximum speed and styling efficiency of your hair. Its two-way rotating barrel helps you in straightening hair and adds the option curling and adding body and shine to your hair. When choosing the right appliance, your hair type plays a vital role in the kind of plate you need. Plates made from titanium irons quickly heated up and deliver high temperatures very evenly. They are best for use if you have coarse or curly hair. Appliances made from ceramic irons can provide uniform temperatures on a majority of hair textures. However, be cautious of metal plates that have a coating with ceramic. Over time, the ceramic may wear down, and the metals base will cease from delivering temperatures evenly. Appliances made from tourmaline plates or ionic plates are great for use by users with damaged hair.